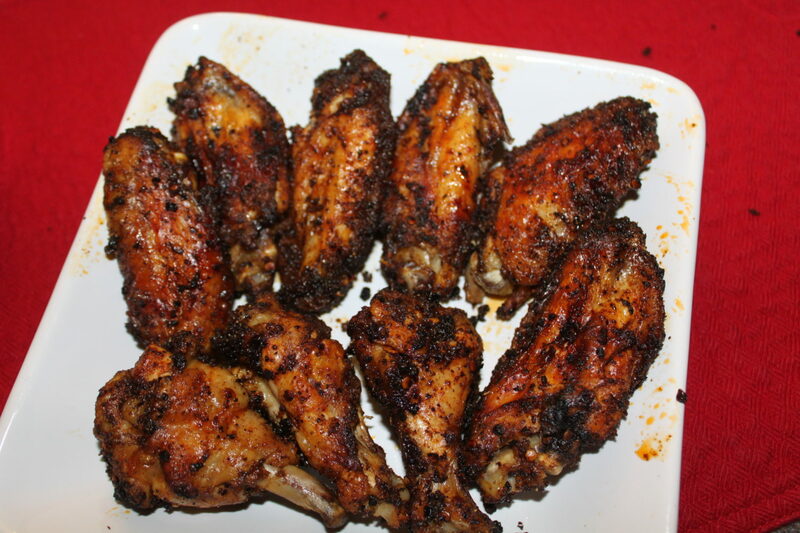 If you love wings, then you are going to love this recipe for Baked Chicken Wings! Chicken wings have become more popular than ever. In fact, over 1.23 billion wings will be sold this year. Jim and I both love traditional chicken wings, however, we are also know that deep fried foods are one of the “not so good” things you can eat. So our solution – Baked Chicken Wings! And by substituting a dry rub for the traditional hot sauce, we will also save some calories without sacrificing the flavor or the heat. Here’s to the big game, and the ability to enjoy it with a little less ‘post game guilt’! 1. Remove tips from chicken wings (and save for stock later). Thoroughly dry the chicken wings with paper towels to remove any excess liquid and let rest. 2. Combine all dry ingredients in a bowl. Mix well. 3. Place chicken wings in a large bowl. 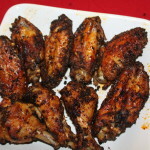 Drizzle with olive oil and rub evenly into chicken wings. Wings placed on a baking rack over a cookie sheet to allow for a crisper texture. 4. Sprinkle half of the dry rub on top of the chicken wings. Rub it in with your hands. Flip wings and sprinkle the remaining rub onto the wings. Rub evenly. 5. Place a baker’s rack over the top of a cookie sheet. Line the rack with the wings. 6. Bake at 350 degrees for 20 minutes, flip, and bake for another 10 minutes, then turn the broiler on for an additional 10 minutes to make crispy. Make sure the internal temperature reaches 165 degrees. 7. Remove from oven, let cool and serve. Great if served with celery and ranch/blue cheese dressing. For some other good Superbowl Recipes, click on the link to visit our Friday Recipe page. Remove tips from chicken wings (and save for stock later). Thoroughly dry the chicken wings with paper towels to remove any excess liquid and let rest. Combine all dry ingredients in a bowl. Mix well. Place chicken wings in a large bowl. 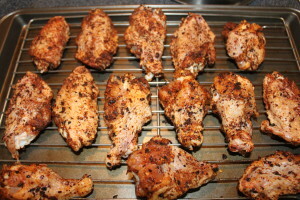 Drizzle with olive oil and rub evenly into chicken wings. Sprinkle half of the dry rub on top of the chicken wings. Rub it in with your hands. Flip wings and sprinkle the remaining rub onto the wings. Rub evenly. Place a baker's rack over the top of a cookie sheet. Line the rack with the wings. Bake at 350 degrees for 20 minutes, flip, and bake for another 10 minutes, then turn the broiler on for an additional 10 minutes to make crispy. Make sure the internal temperature reaches 165 degrees. Great if served with celery and ranch/blue cheese dressing. ← Ornamental Peppers In The Landscape..Spice Up Your Flower Beds and Your Taste Buds!